The film was among the most expensive Hindi cinema (Bollywood) productions and earned the highest revenue for any Indian film at that time. Adjusted for inflation, Mother India still ranks among the all-time Indian box office hits. It was released in India amid fanfare in October or November 1957, and had several high-profile screenings, including one at the capital, New Delhi, attended by the country's president and prime minister. Mother India became a definitive cultural classic and is regarded as one of the best films in Indian and world cinema. It was India's first submission for the Academy Award for Best Foreign Language Film in 1958, where it got the nomination and lost the award by just one vote. The film won the All India Certificate of Merit for Best Feature Film, the Filmfare Best Film Award for 1957, and Nargis and Khan won the Best Actress and Best Director awards respectively. The film is set in 1957, the present day at the time of the shooting. When construction of an irrigation canal to the village is completed, Radha (Nargis), considered to be the "mother" of the village, is asked to inaugurate the canal. She remembers her past when she was newly married. The wedding between Radha and Shamu (Raaj Kumar) is paid for by Radha's mother-in-law, who borrows the money from the moneylender Sukhilala (Kanhaiyalal). The conditions of the loan are disputed, but the village elders decide in favour of the moneylender, after which Shamu and Radha are forced to pay three quarters of their crop as interest on the loan of ₹500 (valued at about US$105 in 1957). [a][b] While Shamu works to bring more of their rocky land into use, his arms are crushed by a boulder. Ashamed of his helplessness (being without arms), and humiliated by Sukhilala for living on the earnings of his wife, Shamu decides that he is of no use to his family and permanently leaves Radha and their three sons, walking to his own probable death by starvation. Soon after, Radha's youngest son and her mother-in-law died. A severe storm and the resulting flood destroys houses in the village and ruins the harvest. Sukhilala offers to save Radha and her sons if she trades her body to him for food. Radha vehemently refused his offer but had to also lose her infant (her fourth son) to the atrocities of the storm. Although the villagers begin initially to evacuate the village, they decide to stay and rebuild it, persuaded by Radha. Khan was inspired by American author Pearl S. Buck and her books The Good Earth (1931) and The Mother (1934); he also saw the film The Good Earth (1937), directed by Sidney Franklin. The Mother chronicled the life of a Chinese woman, including her married life and lonely struggle after being abandoned by her husband. Aspects of Mother India, such as moneylenders, toiling on land, and rearing children through hardship were part of the story. Khan originally drew upon these influences in making his 1940 film Aurat, the original version of Mother India. Khan bought the rights of Aurat from the production company National Studios for ₹35,000 (valued at about US$7,350 in 1957). [a] Stylistic elements of Mother India show similarities with Vsevolod Pudovkin's Soviet silent film Mother (1926); Our Daily Bread (1934), directed by King Vidor; and films of Alexander Dovzhenko. Certain imagery in the film, such as "happy farmers, sickles in their hand, smiling from behind ripening crops", resemble posters by Soviet constructivist artists. Nargis was the director's first choice for the role of Radha, and despite only being aged 26 at the time, she played the role of the new wife, young single mother and an aged mother of two sons. Nargis—the reigning queen of Hindi cinema at the time—had started her career in a leading role with Khan's Taqdeer (1943) and acted under his direction in Humayun (1945) and Andaz (1949). Mother India is generally regarded as Nargis's best performance and was her last major film before retirement after marriage. Khan had wanted to cast Sabu Dastagir, a Hollywood star of Indian origin, as Birju. Dastagir travelled to India from Los Angeles, stayed in a hotel in Mumbai (then known as Bombay) and received a retainer. However, delays and obstacles in beginning shooting and getting a work permit for Dastagir led to his dismissal from the project. Dilip Kumar, an established actor in the Hindi film industry, had originally expressed an interest in playing Birju, which Khan found agreeable; Dilip Kumar agreed to play Shamu as well. However, Nargis objected that the public would not accept their casting as mother and son because she had done several romantic films alongside him. Sunil Dutt—with the experience of just one film—was finally cast, after Mukri, a comedian in the film, introduced him to Khan. Sajid Khan, the actor who portrayed the young Birju, was unknown at the time, and was from a poor family from the Mumbai slums. Sajid's salary in the film was ₹750. He was later adopted by Mehboob Khan. Subsequently, Raaj Kumar was cast as Shamu and Rajendra Kumar as Ramu. Mother India was the first successful film and a turning point in the careers of Dutt, Raaj Kumar and Rajendra Kumar. The initial filming for Mother India began unexpectedly, even before the script and cast were finalised. In 1955, parts of Uttar Pradesh suffered from major flooding. Cinematographer Faredoon Irani travelled to flood-afflicted districts to shoot generic flood scenes. The scheduled principal photography started in 1955 with a budget of ₹20–25 lakh (approximately US$420,000–525,000 in 1957[a]). However, the budget increased to ₹35–40 lakh (approximately US$735,000–840,000 in 1957[a]) by the end of the filming because of the outdoor sessions and cast and crew's salaries. Several indoor scenes for the film were shot in 1956 at Mehboob Studios in Bandra, Mumbai. Khan and Irani attempted to shoot frequently on location to make the film as realistic as possible. Locations included various villages in Maharashtra, Gujarat (Maharashtra and Gujarat together formed Bombay State then) and Uttar Pradesh. The film was shot in 35mm. Contemporary cinematographer Anil Mehta has noted the mastery of Irani's cinematic techniques in shooting the film, including his "intricate tracks and pans, the detailed mise en scène patterns Irani conceived, even for brief shots—in the studios as well as on location". The film took about three years to make, from early organisation, planning, and scripting to completion of filming. In a November 1956 interview, Nargis described the film shoot and her role as the most demanding of her career. Mother India was shot in Gevacolor, later converted to Technicolor. It was shot mostly using the sync sound technique, which was common at the time; some scenes were dubbed. No reliable data is available on the box office earnings of Mother India. It was in continuous distribution in theatres in India until the mid-1990s. There was a renewed interest in the film in the 1970s causing an upsurge in ticket sales. According to Chatterjee, it did exceptionally good business in Delhi, Uttar Pradesh, Gujarat, Karnataka (then called Mysore State) and Maharashtra. Film trade websites provide estimates of its business. Box Office India gave the film's net collection as ₹40 million and its gross as ₹80 million, the highest for an Indian film up until Mughal-e-Azam (1960), while estimating that Mother India's inflation-adjusted net would be equivalent to ₹1.173 billion in January 2008. Box Office India later estimated in 2017 that Mother India had over 100 million footfalls at the domestic box office, making it one of the highest-grossing Indian films of all time when adjusted for inflation. The film's success led Khan to name his next film Son of India. Released in 1962, it was not well received. Mother India was dubbed in several European languages including Spanish, French and Russian; it did substantial business in Greece, Spain and Russia and was released in the Eastern Bloc countries. Technicolor arranged one screening of the film in Paris on 30 June 1958, under the name Les bracelets d'or ("The Gold Bracelets"). It did minimal business in Paris, but fared better in French colonies. It was successful in the Latin American countries of Peru, Bolivia, and Ecuador. Mother India was also acclaimed across the Arab world, in the Middle East, parts of Southeast Asia, and North Africa and continued to be shown in countries such as Algeria at least ten years after its release. It was released in the US on 9 July 1959 to lukewarm response, and the UK release in 1961 was also a commercial failure. The initial international version with English subtitles was 40 minutes shorter than the Indian release. As of 2013, Mother India is available on DVD in all regions NTSC format, distributed by the Eros Entertainment. In a 2002 article in The Village Voice, film critic J. Hoberman described the film as "an outrageous masala of apparently discordant elements." He characterised it as a mixture of "indigenous versions of Soviet-style tractor-opera, Italian neo-realism, Hollywood kiddie-cuteness, a dozen Technicolor musical numbers, and, most significantly, a metaphoric overlay of pop Hinduism." Hoberman criticised the acting as "broad", and also wrote about the "vaguely left-wing" nationalist overtone of the film. Author Phill Hall, writing for Film Threat in 2002, described the film as exceptionally sluggish and one-dimensional, and lampooned it saying "it takes the strongest of constitutions to endure this film without entertaining notions of matricide." Jonathan Romney in his 2002 report in The Independent observed the earth-mother Radha as "India's answer to Anna Magnani" and the film as "an all-out exercise in ideological myth-making." Women's Feature Service, in a 2007 article, noted Mother India as "one of the most outstanding films of the post-Independence era." Ziya Us Salam of The Hindu wrote in her 2010 report: "Mehboob was able to blend the individual with the universal, thereby enhancing the film's appeal without compromising on its sensitivity." Mother India, its star Nargis, and the director Khan received many awards and nominations. Nargis won the Filmfare Best Actress Award in 1958 and became the first Indian to receive the Best Actress award at the Karlovy Vary International Film Festival in present-day Czech Republic. Mother India won the Filmfare Award for Best Film and scooped several other Filmfare awards including Best Director for Khan, Best Cinematographer for Faredoon Irani, and Best Sound for R. Kaushik. In 1958, the film became India's first submission for the Academy Award for Best Foreign Language Film and was chosen as one of the five nominations for the category. [g] The international version, 120 minutes long, was sent for the Oscars. Additionally, this version had English subtitles, and dropped Mehboob Productions' logo, which featured the Communist hammer and sickle, to appease the Academy. The 120-minute version was later distributed in the US and UK by Columbia Pictures. The film came close to winning the Academy Award, but lost to Federico Fellini's Nights of Cabiria by a single vote. Khan was utterly disappointed at not winning the award. "He had seen the other films in the fray and believed Mother India was far superior to them" recalled Sunil Dutt years later. It also won two awards at the 5th National Film Awards in 1957: an All India Certificate of Merit for Best Feature Film and Certificate of Merit for Best Feature Film in Hindi. Mother India has been described as "perhaps India's most revered film", a "cinematic epic", a "flag-bearer of Hindi cinema and a legend in its own right", Mehboob Khan's magnum opus and an "all-time blockbuster", which ranks highly among India's most successful films. It was in continuous distribution, being played in theatres for more than three decades; the record ended in the mid-1990s with the advent of satellite television and a change in Indian film-viewing habits. Mother India belongs to only a small collection of films, including Kismet (1943), Mughal-e-Azam (1960), Sholay (1975) Hum Aapke Hain Koun..! (1994), and Dilwale Dulhania Le Jayenge (1995) which are repeatedly watched throughout India and are viewed as definitive Hindi films with cultural significance. It is also among the only three Indian films to be nominated for the Academy Award for Best Foreign Language Film (the others being Salaam Bombay! and Lagaan). The Hindustan Times (in 2007) identifies the "film's pungent social references" which are "too harsh to be sold at a profit today. But this heartrending tale filled Indians with hope and pride then." The film was remade in the Telugu language as Bangaru Talli in 1971, and in Tamil as Punniya Boomi in 1978. Mother India is ranked No. 80 in Empire magazine's "The 100 Best Films of World Cinema" in 2010. It is listed among the only three Hindi films in the book 1001 Movies You Must See Before You Die (the others being Dilwale Dulhania Le Jayenge and Deewaar). Film critic Anupama Chopra included it in her list of top 100 films in world cinema. In 2005, Indiatimes Movies ranked the film amongst the "Top 25 Must See Bollywood Films". It was ranked third in the British Film Institute's 2002 poll of "Top 10 Indian Films". It was also included in TIME's list of the best Bollywood classics in 2010, and in CNN-IBN's list of the "100 greatest Indian films of all time" in 2013. The film was premiered in the Cannes Classics section of the 2004 Cannes Film Festival. Rajeev Masand of CNN-IBN notes that Mother India "didn't just put India on the world map, it also defined Hindi cinema for decades that followed." Film critic Dave Kehr agrees that it influenced Indian films for the next 50 years. A 1983 Channel 4 documentary on Hindi cinema describes the film as setting a benchmark in Indian cinema. The shooting stance of Nargis at the end of the film is one of the all-time iconic images of Hindi cinema. Other iconic scenes include Radha pulling the plough through the field (see film poster at the top) and feeding chapatis to her two sons as they pull the plough. The Hindustan Times states that Nargis symbolised mothers in "which all the mothers [in later films] had the same clichéd roles to play. Representing both motherhood and Mother Earth, who also nurtures and occasionally punishes, Nargis immortalised the Indian mother on celluloid." The film pioneered the portrayal of two morally opposed brothers personifying good and evil, which became a repeated motif in Hindi films, including Gunga Jumna (1961) and Deewaar (1975). The rebellious Birju also inspired the "angry young man" stock character that arose in 1970s Hindi cinema. According to scholar Brigitte Schulze, Mother India played a key role in shaping the young Republic of India's national identity in its early years following independence from the British Raj, due to how the film was able to successfully convey a sense of Indian nationalism to the urban and rural masses. ^ The exact year when the loan was borrowed is not mentioned in the film, so the value is given in 1957 (year of release of the film) exchange rate. ^ At that time (early 1950s) the Joint Chief Controller of Imports, Government of India, regulated import of film stocks. The maximum number of prints for a film in those days were usually around 60. However, Mehboob applied for the permission to import stocks needed for 180 prints. As a result, a prolonged negotiation between the import authorities and Mehboob Production ensued. The data on exact import amount is not available. ^ a b c Aḵẖtar, Jāvīd; Kabir, Nasreen Munni (2002). Talking Films: Conversations on Hindi Cinema with Javed Akhtar. Oxford University Press. p. 49. ISBN 9780195664621. Archived from the original on 8 January 2014. most of the writers working in this so-called Hindi cinema write in Urdu: Gulzar, or Rajinder Singh Bedi or Inder Raj Anand or Rahi Masoom Raza or Vahajat Mirza, who wrote dialogue for films like Mughal-e-Azam and Gunga Jumna and Mother India. So most dialogue-writers and most song-writers are from the Urdu discipline, even today. ^ a b BoxOffice India. ^ a b c Sinha 2006, p. 248. ^ Gandhi 2002, p. 214. ^ Jayawardena 1995, p. 99. ^ a b Chatterjee 2002, p. 10. ^ Chatterjee 2002, p. 20. ^ "Whose movie is it anyway?". www.rediff.com. ^ Rangoonwala 2003, p. 55. ^ a b c d e f g h Hindustan Times 2007a. ^ Pauwels 2007, p. 178; Chatterjee 2002, p. 41. ^ Chatterjee 2002, pp. 41–42. ^ Chatterjee 2002, p. 12. ^ Chatterjee 2002, pp. 31–32. ^ Chatterjee 2002, p. 32. ^ a b Chatterjee 2002, p. 22. ^ Chatterjee 2002, p. 31. ^ Bollywood Blockbusters Part 2 2009, 1:27–1:41. ^ Gandhy & Thomas 1991, p. 116. ^ Baskaran 2012, p. 42–43; Rajadhyaksha 1997, p. 404. ^ Rajadhyaksha 1997, p. 404; Gandhy & Thomas 1991, p. 117. ^ a b Chatterjee 2002, p. 19. ^ Hindustan Times 2007a; Bollywood Blockbusters Part 2 2009, 2:45–3:09. ^ Chatterjee 2002, p. 61. ^ Chatterjee 2002, p. 45. ^ a b c Salam 2010. ^ a b Chatterjee 2002, p. 41. ^ Hindustan Times 2007a; Bollywood Blockbusters Part 3 2009, 0:26–0:33. ^ a b c d Chatterjee 2002, p. 21. ^ a b Thoraval 2000, pp. 72–75. ^ a b Reuben 1994, p. 233. ^ Bollywood Blockbusters Part 3 2009, 1:15–1:26. ^ a b Chatterjee 2002, p. 58. ^ Chandran, Ashwin. "Gayatri Chatterjee - Symbiosis School for Liberal Arts". www.ssla.edu.in. Retrieved 3 October 2017. ^ a b Chatterjee 2002, p. 68. ^ Raheja 2002; Bollywood Blockbusters Part 3 2009, 2:08–2:42. ^ Bollywood Blockbusters Part 3 2009, 3:41–3:55. ^ Raheja 2002; Chatterjee 2002, p. 68; Bollywood Blockbusters Part 3 2009, 2:59–3:05. ^ Bollywood Blockbusters Part 2 2009, 2:14–2:37. ^ Pauwels 2007, p. 178; Chatterjee 2002, p. 29; Natarajan 1994, pp. 84–86; Gandhy & Thomas 1991, p. 118; Dwyer 2006, p. 2006. ^ a b Dwyer 2006, p. 2006; Woods 2011, pp. 166–168. ^ "Natarajan, Nalini | SAGE Publications Inc". us.sagepub.com. Archived from the original on 3 October 2017. Retrieved 3 October 2017. ^ a b Natarajan 1994, pp. 84–86. ^ Punathambekar, Aswin (30 January 2006). "The Cinematic ImagiNation: Indian Popular Films as Social History (review)". The Velvet Light Trap. 56 (1): 72–73. doi:10.1353/vlt.2006.0009. ISSN 1542-4251. Archived from the original on 3 October 2017. ^ Virdi 2008, p. 231. ^ Mishra, Vijay (2002). Bollywood Cinema: Temples of Desire. Psychology Press. ISBN 9780415930147. ^ Mishra 2002, p. 69. ^ Gokulsing & Dissanayake 2004, p. 44. ^ a b Eshun 1999. ^ a b c Sridharan 2012. ^ Fong & Chuang 2004, p. 125. ^ a b Kehr 2002. ^ Cousins 2006, p. 232; Ganti 2004, p. 148. ^ Siddiqi 2008, p. 177. ^ Guha 2008, p. 730; Gandhy & Thomas 1991, p. 123; Mishra 2002, p. 81; National Media Museum 2007; Malik 2003, p. 70. ^ Bollywood Blockbusters Part 1 2009, 0:45–1:25. ^ Bollywood Blockbusters Part 1 2009, 2:33–3:28. ^ Virdi 2008, p. 116. ^ Woods 2011, pp. 166–168; Chakravarty 1993, p. 155; Virdi 2008, p. 117. ^ Vohra 2001, p. 218. ^ Barua 1996, p. 229. ^ Slocum, John David (2005). Terrorism, Media, Liberation. Rutgers University Press. ISBN 9780813536088. ^ a b Slocum 2005, p. 236. ^ Woods 2011, pp. 166–168; Chakravarty 1993, p. 155; Mishra 2002, p. 79; Dwyer 2006, p. 148. ^ a b Virdi 2003, pp. 114–118. ^ Mishra 2002, p. 79. ^ Chakravarty 1993, p. 155. ^ Dwyer 2006, p. 148. ^ Heide 2002, p. 237. ^ Woods 2011, pp. 166–168; Eshun 1999. ^ a b Mishra 2002, p. 87. ^ a b Mishra 2002, p. 62. ^ Roy 1998, p. 167. ^ a b Sinha 2006, p. 249. ^ Raheja 2002; Bollywood Blockbusters Part 4 2009, 0:24–0:29; Mishra 2002, p. 65. ^ a b c d Chatterjee 2002, pp. 74–75. ^ a b Chatterjee 2002, p. 9. ^ Chatterjee 2002, p. 20; Sadoul & Morris 1972, p. 172. ^ a b c d Chatterjee 2002, pp. 77–78. ^ Heide 2002, p. 237; Chatterjee 2002, pp. 77–78; Gopal & Moorti 2008, p. 28; Mishra 2002, p. 66. ^ Chatterjee 2002, p. 77. ^ Chatterjee 2002, p. 78. ^ Gallagher 1976, p. 344. ^ a b c Hoberman 2002. ^ Roy 1998, p. 158. ^ Ganti 2004, p. 96. ^ Reed 1958, p. 215. ^ The 30th Academy Awards (1958) 2012. ^ a b Chatterjee 2002, p. 79. ^ Bollywood Blockbusters Part 1 2009, 2:55–3:10; Chatterjee 2002, p. 73. ^ "Lagaan will win Oscar, says Sunil Dutt". The Times of India. The Times Group. 18 March 2002. Archived from the original on 18 December 2014. Retrieved 11 July 2013. ^ Directorate of Film Festivals 1957, pp. 2–3. ^ Morcom 2007, pp. 138–139. ^ a b Morcom 2007, pp. 139–144. ^ Morcom 2007, p. 140. ^ Ranade 2006, p. 361. ^ a b Pauwels 2007, p. 178. ^ Malik 2003, p. 70. ^ Dissanayake 1993, p. 181. ^ Bhopatkar, Tejashree (25 April 2013). "Bollywood and Oscars over 100 years of Cinema". The Times of India. Archived from the original on 18 December 2014. Retrieved 11 September 2014. ^ Rajadhyaksha & Willemen 1998, p. 112. ^ Pillai 2015, p. 242. ^ The Times of India 2005. ^ British Film Institute 2002. ^ "100 Years of Indian Cinema: The 100 greatest Indian films of all time". CNN-IBN. 13 April 2013. Archived from the original on 13 August 2014. Retrieved 11 August 2014. ^ "'Mother India' will hit Cannes classic screen". The Economic Times. 10 May 2004. Archived from the original on 14 October 2014. Retrieved 21 October 2014. ^ Bollywood Blockbusters Part 1 2009, 0:38–0:44. ^ Mishra 2002, p. 66. ^ Gandhy & Thomas 1991, p. 118; Majumdar 2009, p. 151. ^ Gandhy & Thomas 1991, p. 118. ^ Chatterjee 2002, p. 44. ^ a b Ganti 2004, p. 149. ^ Schulze, Brigitte (September 2002). "The Cinematic 'Discovery of India': Mehboob's Re-Invention of the Nation in Mother India". Social Scientist. 30 (9/10): 72. doi:10.2307/3517959. "1001 Before You Die". www.1001beforeyoudie.com. Archived from the original on 19 November 2010. Retrieved 4 October 2012. On this website, click "view list" under 1001 movies. Then in the search box, search for Mother India. "25 Must See Bollywood Movies – Special Features-Indiatimes – Movies". The Times of India. 2005. Archived from the original on 7 February 2009. Retrieved 5 March 2011. "5th National Film Awards" (PDF). Directorate of Film Festivals. Archived (PDF) from the original on 3 November 2013. Retrieved 2 September 2011. "50 Years Later, the 'Mother India' Legend Endures". DNA India. 25 October 2007. Archived from the original on 24 September 2015. Retrieved 2 August 2015. Barua, Mahasveta (1996). "Television, Politics, and the Epic Heroine: Case Study, Sita". In Bahri, Deepika; Vasudeva, Mary (eds.). Between the Lines: South Asians and Postcoloniality. Temple University Press. ISBN 978-1-56639-468-0. Archived from the original on 15 May 2016. Baskaran, S. Theodore (2012). "Nargis". In Patel, Bhaichand (ed.). Bollywood's Top 20: Superstars of Indian Cinema. Penguin Books India. ISBN 978-0-670-08572-9. Archived from the original on 12 May 2016. Bollywood Blockbusters: Mother India (Part 1) (Documentary). CNN-IBN. 2009. Archived from the original on 15 July 2015. Bollywood Blockbusters: Mother India (Part 2) (Documentary). CNN IBN. 2009. Archived from the original on 11 July 2015. Bollywood Blockbusters: Mother India (Part 3) (Documentary). CNN IBN. 2009. Archived from the original on 8 July 2015. Bollywood Blockbusters: Mother India (Part 4) (Documentary). CNN IBN. 2009. Archived from the original on 3 July 2015. Chakravarty, Sumita S. (1993). National Identity in Indian Popular Cinema: 1947-1987. University of Texas Press. ISBN 978-0-292-78985-2. "Changing Face of Bollywood Screen Mothers". Hindustan Times via HighBeam Research (subscription required). 14 May 2006. Archived from the original on 10 June 2014. Retrieved 18 June 2012. "Top 10 Indian Films". British Film Institute. 2002. Archived from the original on 15 May 2011. Chatterjee, Gayatri (2002). Mother India. British Film Institute. ISBN 978-0-85170-917-8. Chopra, Anupama (2012). "Anupama's top 100 films". Archived from the original on 3 June 2013. Corliss, Richard (27 October 2010). "Best of Bollywood". Time. Archived from the original on 21 April 2013. Cousins, Mark (2006). The Story of Film: A Worldwide History. Da Capo Press. ISBN 978-1-56025-933-6. Dissanayake, Wimal (1993). Melodrama and Asian Cinema. Cambridge University Press. ISBN 978-0-521-41465-4. Dwyer, Rachel (2006). Filming the Gods: Religion and Indian Cinema. Routledge. ISBN 978-0-203-08865-4. Eshun, Esi (September 1999). 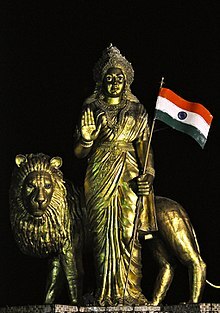 "Mother India". New Internationalist. New Internationalist Publications (316). Archived from the original on 2 March 2013. Retrieved 18 June 2012. Fong, Mary; Chuang, Rueyling (2004). Communicating Ethnic and Cultural Identity. Rowman & Littlefield. ISBN 978-0-7425-1738-7. Frick, Katherine (2006). "Mayo, Katherine". Pennsylvania Center for the Book. Archived from the original on 14 December 2012. Retrieved 15 June 2011. Gallagher, Michael (1976). "Indian and Western Cinema: Film Report". Studies: An Irish Quarterly Review. Irish Province of the Society of Jesus. 65 (260). JSTOR 30090035. Gandhi, Mahatma (12 November 2002). The Essential Gandhi: An Anthology of His Writings on His Life, Work, and Ideas. Random House Digital. ISBN 978-1-4000-3050-7. Gandhy, Behroze; Thomas, Rosie (1991). Gledhill, Christine (ed.). Stardom: Industry of Desire. Routledge. ISBN 978-0-415-05217-7. Gokulsing, K.; Dissanayake, Wimal (2004). Indian Popular Cinema: A Narrative of Cultural Change. Trentham Books. ISBN 978-1-85856-329-9. Gopal, Sangita; Moorti, Sujata (16 June 2008). Global Bollywood: Travels of Hindi Song and Dance. University of Minnesota Press. ISBN 978-0-8166-4579-4. Guha, Ramachandra (15 September 2008). India After Gandhi: The History of the World's Largest Democracy. Pan Macmillan. ISBN 978-0-330-39611-0. Hall, Phill (19 August 2002). "Mother India". Film Threat. Archived from the original on 5 November 2012. Retrieved 15 February 2013. Heide, William Van der (2002). Malaysian Cinema, Asian Film: Border Crossings and National Cultures. Amsterdam University Press. ISBN 978-90-5356-580-3. Hoberman, J. (20 August 2002). "Artificially Preserved". The Village Voice. Archived from the original on 19 August 2011. Retrieved 7 June 2012. Jayawardena, Kumari (1995). The White Woman's Other Burden: Western Women and South Asia During British Colonial Rule. Routledge. ISBN 978-0-415-91104-7. Kabir, N.M. (2010). The Dialogue of Mother India: Mehboob Khan's Immortal Classic. Niyogi Books. ISBN 978-81-89738-58-7. Kadapa-Bose, Surekha (17 January 2011). "India: India, Through Cinema's Lens". Women's Feature Service. HighBeam Research (subscription required). Archived from the original on 10 June 2014. Retrieved 18 June 2012. Kehr, Dave (23 August 2002). "Mother India (1957). Film in review; 'Mother India'". The New York Times. Retrieved 7 June 2012. Lall, Randy. "100 Greatest Bollywood Soundtracks Ever". Planet Bollywood. Archived from the original on 15 January 2013. Retrieved 23 February 2011. Majumdar, Neepa (25 September 2009). Wanted Cultured Ladies Only! : Female Stardom and Cinema in India, 1930s–1950s. University of Illinois Press. ISBN 978-0-252-07628-2. Malik, Amita (2003). "1947–1961: The Golden Age". In Gulzar; Nihalani, Govind; Chatterjee, Saibal (eds.). Encyclopaedia of Hindi Cinema: An Enchanting Close-Up of India's Hindi Cinema. Encyclopædia Britannica, Popular Prakashan. ISBN 978-81-7991-066-5. Morcom, Anna (2007). Hindi Film Songs and the Cinema. Ashgate Publishing. ISBN 978-0-7546-5198-7. "Mother India". Amazon.com. Retrieved 28 February 2013. "Mother India—Celebrating Indian Cinema". National Media Museum. 2007. Archived from the original on 25 December 2013. Retrieved 9 March 2013. "Mother India Turns 50". Hindustan Times. HighBeam Research (subscription required). 25 October 2007. Archived from the original on 10 June 2014. Retrieved 18 June 2012. Natarajan, Nalini (1994). "Woman, Nation and Narration in Midnight's Children". In Grewal, Inderpal; Kaplan, Caren (eds.). Scattered Hegemonies: Postmodernity and Transnational Feminist Practices. University of Minnesota Press. ISBN 978-0-8166-2138-5. "Notes of Naushad ... Tuneful as Ever". The Hindu. Chennai, India. 13 May 2004. Archived from the original on 8 November 2012. Retrieved 7 March 2011. Pauwels, Heidi Rika Maria (2007). Indian Literature and Popular Cinema: Recasting Classics. Routledge. ISBN 978-0-415-44741-6. "Planet Bollywood". Planet Bollywood. 2011. Archived from the original on 15 January 2013. Retrieved 15 June 2011. Raheja, Dinesh (2002). "Mother Earth Reincarnated: Mother India". Rediff.com. Archived from the original on 25 October 2012. Retrieved 23 February 2011. Rajadhyaksha, Ashish (1997). "Nargis". In Nowell-Smith, Geoffrey (ed.). The Oxford History of World Cinema. Oxford University Press. ISBN 978-0-19-811257-0. Rajadhyaksha, Ashish; Willemen, Paul, eds. (1998) . Encyclopaedia of Indian Cinema (PDF). Oxford University Press. ISBN 019-563579-5. Ranade, Ashok Da. (1 January 2006). Hindi Film Song: Music Beyond Boundaries. Bibliophile South Asia. ISBN 978-81-85002-64-4. Rangoonwala, Firoze (2003). "1931–1946: The Emergence of Talkies". In Ramchandani, Indu (ed.). Encyclopaedia of Hindi Cinema. Encyclopædia Britannica, Popular Prakashan. ISBN 978-81-7991-066-5. Raza, Shahla (8 May 2007). "India: Film Women Tame Violent Heroes". Women's Feature Service. HighBeam Research (subscription required). Archived from the original on 10 June 2014. Retrieved 18 June 2012. Reed, Sir Stanley (1 January 1958). The Times of India Directory and Year Book Including Who's Who. Bennett, Coleman. Reuben, Bunny (December 1994). Mehboob, India's DeMille: the First Biography. Indus. ISBN 978-81-7223-153-8. Romney, Jonathan (5 May 2002). "Film: It's A Curry Western. With Sushi The Warrior Asif Kapadia 86 mins, 12 Mother India Mehboob Khan 175 mins, U Panther Panchali Satyajit Ray 115 mins, U". The Independent. HighBeam Research (subscription required). Archived from the original on 25 January 2013. Retrieved 18 June 2012. Roy, Parama (1998). Indian Traffic: Identities in Question in Colonial and Postcolonial India. University of California Press. ISBN 978-0-520-20487-4. Salam, Ziya Us (8 January 2010). "Mother India (1957)". The Hindu. (Chennai, India). Retrieved 28 March 2015. Siddiqi, Yumna (2008). Anxieties of Empire and the Fiction of Intrigue. Columbia University Press. ISBN 978-0-231-13808-6. Sinha, Mrinalini (2006). Specters of Mother India: The Global Restructuring of an Empire. Duke University Press. ISBN 978-0-8223-3795-9. Slocum, John David (July 2005). Terrorism, Media, Liberation. Rutgers University Press. ISBN 978-0-8135-3608-8. Sridharan, Tarini (25 November 2012). "Mother India, not Woman India". The Hindu. Chennai, India. Archived from the original on 6 January 2013. Retrieved 5 March 2012. Statistical Abstract of the United States: 1959 (PDF). US Bureau of the Census. 1959. Archived (PDF) from the original on 19 July 2013. Retrieved 6 February 2013. "The 100 Best Films of World Cinema:80. Mother India". Empire. Archived from the original on 18 October 2012. Retrieved 23 February 2011. "The 30th Academy Awards (1958) Nominees and Winners". Academy of Motion Picture Arts and Sciences. 2012. Archived from the original on 11 June 2012. Thoraval, Yves (2000). The Cinemas of India. Macmillan India. ISBN 978-0-333-93410-4. "Top Earners 1950–1959 (Figures in Ind Rs)". BoxOfficeIndia.com. Archived from the original on 18 January 2008. Virdi, Jyotika (August 2008). "Deewar/Wall (1975)—Fact, Fiction and the Making of a Superstar". In Kavoori, Anandam P.; Punathambekar, Aswin (eds.). Global Bollywood. NYU Press. ISBN 978-0-8147-4799-5. Vohra, Ranbir (2001). The Making of India: A Historical Survey. M.E. Sharpe. ISBN 978-0-7656-0711-9. Archived from the original on 11 January 2014. Woods, Jeannine (2011). Visions of Empire and Other Imaginings: Cinema, Ireland and India 1910-1962. Peter Lang. ISBN 978-3-03911-974-5.